Soon after, the young couple started looking at properties around Los Angeles for fun in the event they decided to build a small house somewhere. Along the way, they began stumbling across run-down properties of various sizes around the city and began inquiring about what it would take to gain access to them. What they discovered were numerous barricades that hindered development. Most of the properties Gleicher and Wood saw were on hillsides or narrow streets in low-income communities. There were no foundation structures in place or evidence of previous use. “Once we became aware of all of this land, we wanted to do something to beautify it and that we were passionate about,” Wood says. Farm LA became a 501(c)(3) non-profit shortly after, but the organization officially launched May 1, 2015. Since that time, Gleicher and Wood have worked to promote and support the mission of Farm LA by building small public sidewalk gardens in rundown curbside plots around different Los Angeles communities. Currently, the organization has 11 of these plots, mostly located on the east side of Los Angeles. Two of these gardens have been certified by LA County as urban gardens, and Farm LA will begin prepping and selling lima bean kits from these gardens this December. Although these are the only certified plots, all of Farm LA’s gardens are fortified with organic matter to enrich the soil. The upkeep and timely harvesting of the curbside plots is made possible with the help of dedicated and passionate volunteers. Over the past two years, the organization has been able to generate a large volunteer base and now boasts 500 subscribers to its newsletter. 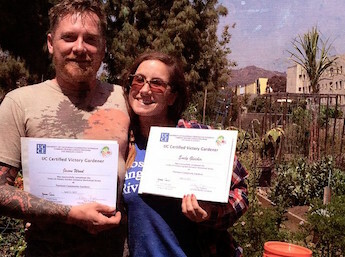 Some of these volunteers are people who Gleicher and Wood met as part of their certification classes for the Grow LA Victory Garden Initiative, a four-session program for beginning gardeners run by the University of California Cooperative Extension. The Victory Garden program nurtured the already budding passion for gardening in both Wood and Gleicher and provided them with the proper tools and knowledge to not only conceive Farm LA, but also advocate for more opportunities for urban farm development and policies from the city. Part of this work includes working with the Los Angeles Food Policy Council (LAFPC) to help champion Assembly Bill (AB) 551, which empowers California cities and counties to create policies in support of Urban Agriculture Incentive Zones, according to information provided on the LAFPC website. The bill aligns with Farm LA’s mission of producing healthy, locally grown food in areas that are food deserts using sustainable processes and technologies. Land owners within the incentive zones can receive a significant reduction in their property tax rates if they offer their land up for agriculture use. Toward this end, Farm LA is working to provide a list of available properties for this type of expansion to LAFPC to present to the county’s planning department. Gleicher and Wood are looking to grow their organization and continue to work to attain a large parcel of land to convert. Part of that plan includes continuing to help support mini-orchards and fruit-sharing initiatives through Wood’s side project We Farm, locating more properties in neighborhoods where development of urban agriculture can have a real impact, and possibly creating small solar farms to put money back into communities. Gleicher says if they are able to attain the right funding, they can start focusing on cultivating more drought-tolerant edibles, such as certain types of corn, barley, and lima beans, and developing atmospheric water generators to take water directly from the desert air.